(12 weekly classes of 90 minutes each, in 3 Modules of 4 classes each). Using DreamBirth®, 95-100% of women have successfully conceived. It is especially efficacious for women who have tried multiple IVF’s and were still unable to conceive, or if they did, were not able to keep the pregnancy. DreamBirth® is also a beautiful adjunct to any other modality that is being used for conception; it will enhance the use of acupuncture, herbs, and IVF. In these classes we will experience many of the exercises in Catherine Shainberg’s book, DreamBirth, because there is no substitute for experiencing the exercises; and experiencing them as a practitioner, you will be on more solid ground. You will know more accurately if the exercise makes sense to use with a particular client if you have experienced it yourself. You will get many exercises for conception that are not in the book, and many exercises not written specifically for conception, but which in our experience are very helpful for that outcome. And you will, of course, learn in which circumstances to use each exercise. One’s intuition and creativity always enter into this work, so an exercise created for a specific situation may work beautifully in another situation. The work promotes your creativity and openness. As a practitioner, you must meld your logical focusing brain with your intuitive, receiving brain. And as you become very open energetically, with your right brain you gently, softly receive, and with your logical left brain you investigate. When did they begin trying to conceive? What do the doctors say? Is there anything physically amiss? Did anybody else in the family have trouble conceiving? (Here you are opening up to the possibility that there are familial, ancestral beliefs that are at play.) And then questions about the relationship they are in, and very tactful questions about money and the place they are currently living in—does she feel it is big enough? It is in relaxed chatting that the clues will emerge, but they must feel no judgment from you. And so there must be no judgment coming from you! Do not worry, this training can help you get there! MODULE 1: Includes Imagery and Your Role as a Practitioner, Pre-Conception Exercises, and Clearing Blocked Emotions. This class reviews how imagery works, how it is learned, how to respond to the necessity of an image, and the importance of practicing the imagery oneself, so that the language of imagery becomes facile and creative. DreamBirth® imparts gifts for all who use it; the practitioner included. This class focuses on pre-conception exercises, to clear the resentments of the past and fears of the future, and exercises for moving past old relationships, and abortions and miscarriages. We discuss as well the nurturing, non-judgmental atmosphere that must be created, while exploring what is getting in the way. By the time women come to get help, they often have gone through the pain of a miscarriage, or have been made to feel “less than” by the medical profession, by family, by friends (or by the woman’s perception that they are judging her), and a lot by herself—her own critical inner judgment. And so loving attention, the same that makes grass grow, and babies flourish, is what the woman needs, as well as you learning to become an intuitive, compassionate detective! And remember, although the classes are organized in a linear fashion, when you actually work with a woman, you respond to what she needs, you work around who she is. You may very well give her exercises for her relationship the very first time you meet her, as that is the crying need of the moment, and not go right away into the pre-conception exercises. These two classes deal with clearing any blocked emotions that are getting in the way. Your will learn exercises to clear anxiety and fear, anger and frustration, feelings of stuckness and depression, guilt and resentment , and pain and grief. You will learn as well, exercises that create optimism and a sense of well-being. MODULE 2: Deals with Clearing Belief Systems, Working with Relationships, and Preparing for Conception. These two classes focus on clearing personal and ancestral belief systems. Belief systems are so familiar, like the air we breathe, we simply think that is the way it is, that it is reality, and not just a belief that can be changed, Great or small beliefs can get in the way: for example,” all the women in my family that have narrow hips have trouble conceiving,” or, “If I have a baby I can’t have a career,” or “if I have a baby my relationship with my husband will be ruined”, …and on and on. Parenting begins before conception, so the relationship with a partner or support person is of paramount importance. In these two classes you will learn many exercises to help with relationships of every kind. You will also learn many exercises for internal preparation, for preparing the ground. MODULE 3: Deals with Conscious Conception , Learning How to Work with Dreams, and Creating Positive Feeling States. You will learn many exercises for conception, including IVF, and the benefits of conscious conception. There are exercises that encourage the flow of hormones that will allow the embryo to implant and flourish. We do exercises that promote the ‘loving attention’ that encourages all life to thrive, and we discuss the subject of timing, the timing that is determined by the soul coming in. Night Dreams are a very important aspect of dialoguing with the subconscious. The night dream always has the dreamer’s highest interest in mind; it will communicate what needs to be worked on, or sometimes congratulate you on your latest insights! Remembering night dreams is a very valuable habit to encourage in a woman wanting to conceive. She can learn how to ask questions of her dreams, essentially her higher knowing. And you, as a practitioner, can learn how to work with dreams, how to ‘open’ them. Your client’s dreams can help guide your work with her. Her night dreams can be your greatest ally in conception. In these two classes we will learn many exercises to create positive emotional feelings; exercises for protection and safety, calming and centering, grounding, greater integration and exercises for protection and safety as well as generic exercises to clean and clear. Finish learning about dream opening and emphasize the importance of responding to the necessity being shown by the "image", how to fine tune your artistry as a practitioner of DreamBirth®. 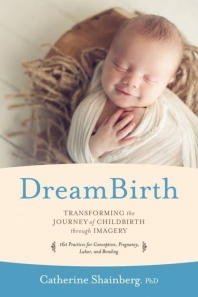 "DreamBirth® is an incredible tool for conception: 95% of the women I worked with have conceived. Many of these women came to me in desperation, still unable to conceive after having multiple IVF’s. DreamBirth® is also a beautiful adjunct to any other modality that is being used for conception; it will enhance the effects of acupuncture, herbs, and IVF."